This is bad. Our time spent out in space seeing what would happen to the Pkunk has apparently put our other allies in jeopardy. We are now departing the Starbase. We will set course directly for Alpha Tucanae. I fear the worst… I can only hope we’re not too late. Captain out. How could I have allowed for this to happen? I must do something to fix this! But how can I stop it? We’ll remain in orbit for a few moments to grieve and contemplate. Afterwards, when we're sufficiently done wallowing in our own misery, I’ll activate the time portal. Zelnick out. Lack of haste makes xenocide. Not very catchy, but that's how SC2 rolls. Yeah. From now on the NPC's will punish the player for not keeping track of the myriad of story lines, and continuing them.. Welcome to one of the things I loved most about SC II. On the other hand, you do have a fully equipped starship, you simply do not need more RU than what you already have. Now it's time to follow all the leads you've been collecting. I hope the game got the message clearly over. With the ZFP there was no indication on the map. No SOI getting smaller, no wandering of the SOI. Just an abrupt end. Also the need for you to return to Starbase regularly to get information. You're simply cut off from certain information channels when away. No ICOM for you (SC3 reference). Just one of the reasons why I encouraged you to make more frequent trips back to the starbase,. You actually will get a fairly significant lead time on your first warning that something bad is going to happen to the ZFP, but only if you talk to Hayes on a regular basis. I suppose the one upshot of your experiment with the Pkunk is that you were informed of this at a point in time where you were planning to jump back to an earlier point anyway. Not the most organic way to learn about this, but I suppose it works well enough. Yeah. He's seeing more and more hints of time running out, he just cannot interpret them correctly, as he's still not connected the dots. I mean Hayes' message of 6 crew members falling unconscious, and feeling "something is very wrong". - This indicates something somewhere has happened, and that now he could go and collect a plot-crucial device which has not existed before. He has what he needs to do so 1. But that doesn't have anything to do with that. Death 999 wrote: Lack of haste makes xenocide. krulle wrote: Yeah. From now on the NPC's will punish the player for not keeping track of the myriad of story lines, and continuing them.. In its own weird way, it is something of which I also find myself having an appreciation for while playing the game. I mean, part of the fun is not knowing how my actions, or in this case inactions, can have tremendous impacts on the space world around me. It's also as if the entire quadrant has its own pulse, and the game continues to change as time goes by, and I'm left trying to figure out how to fit all the pieces together... or prevent them from all falling apart, as it were. These unknown fluctuations can be puzzling and frustrating while also exhilarating and rewarding -- all at the same time! krulle wrote: On the other hand, you do have a fully equipped starship, you simply do not need more RU than what you already have. Now it's time to follow all the leads you've been collecting. I hope the game got the message clearly over. Oh yeah, I've definitely abandoned my mineral resources routines. My ship no longer even carries a single cargo pod! From now on all of my attention is going to be all about solving the mysteries of the game... and saving Earth (and everything else) from utter destruction. Besides, there will be plenty of probes willing to shuffle themselves into my RU container during my next few excursions. That one came out of left field for me. I only went back to starbase to see if Hayes had anything new to say, and I was only half-expecting him to even mention the Pkunk's cliff dive, but I was certainly shocked when I learned the ZFP were among the "no longer with us" club. I must save them! They're so friendly and likeable! krulle wrote: Also the need for you to return to Starbase regularly to get information. You're simply cut off from certain information channels when away. Draxas wrote: Just one of the reasons why I encouraged you to make more frequent trips back to the starbase,. You actually will get a fairly significant lead time on your first warning that something bad is going to happen to the ZFP, but only if you talk to Hayes on a regular basis. I've neglected to make frequent stops back at the base, but I've been on a few long journeys where I've been piecing a lot of this stuff together on my own, but you're both right... I need to check in with Hayes from time to time to see if there's anything new the good folks at home have unveiled for me. Now that I know what will occur to our fun little friends, I'm going to focus my efforts on trying to figure out a way to save both the Pkunk and ZFP... but I'll try to do so without bending too many rules! Heh, I've been informed that I had it wrong anyway. I’ve just finished an intense meeting with our Vindicator’s senior staff, the bridge crew, and Commander Hayes and his appointed starbase officers. There was much discussed, but besides a bunch of finger-pointing and name-calling, there wasn’t much accomplished, with the exception of everybody is totally aware that we have a major problem, and it looks as if we’ll be fighting on two fronts, whereas during both of which we’ll be attempting to prevent the total destruction of not one but two different alien species... and I’ve grown fairly fond of both of them, but with the Zoq-Fot-Pik forming an alliance with our just cause, I’m taking this one personally. 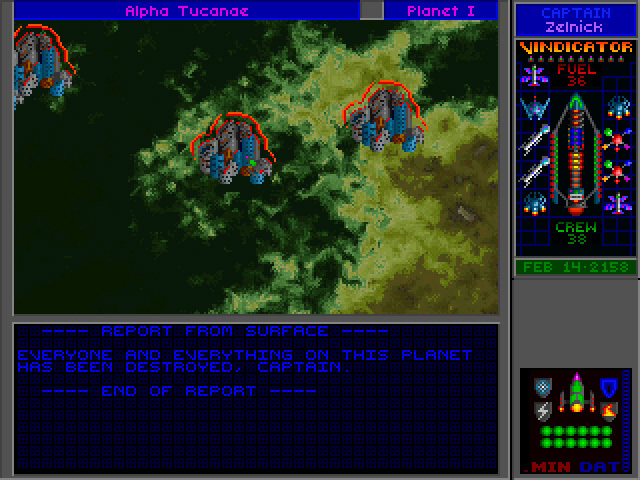 Speaking of which, analysis of the broadcast the starbase team was able to pick up from their transmission receivers of Alpha Tucanae, it seems most likely that the Kohr-Ah are the malicious aggressors of the ZFP’s destroyed civilization. Those bastards will pay dearly for their insolence! Mark my words! However, we need to properly address the issue with the Pkunk before we can begin to solve the crisis of the Zoq-Fot-Pik. We will set course towards Capella. Captain out. As soon as we arrived at our destination point, the Chief Medical Officer placed me into cryogenic stasis, and I assume the rest of crew did their best to amuse themselves for the next five months by playing board games, watching FunRoms, bowling, and blowing up the occasional probe (or anything else they could come up with to pass the time.) Speaking of which, I also called the Melnorme with the Umgah ’Caster to see if they could provide the crew with some adequate diversions. After the front of the Pkunk’s migration wave came into the area, the doctor revived me so I could speak with the Pkunk, and we successfully convinced them to turn around due to the impending Swollen Moon forecast. We will continue to observe the Pkunk’s movements back to their home space while I take a long nap and the crew can have some more R&R. Zelnick out. The Pkunk have arrived at their home in Gamma Krueger. Hopefully since it took so long for their voyage to go back and forth, perhaps they’ll wait much longer before making another attempt. We will continue to monitor their activity. I’m heading back in. Captain out. Uh-oh... Looks like the Pkunk are on the move again! We will move the Vindicator and company towards the Ptolemae region when the Pkunk begin to approach our immediate area. There’s no use in trying to save the ZFP in this timeline; they’ve already undoubtedly been annihilated. We’ll just have to wait and see, or sleep in my case. Zelnick out. As soon as the Pkunk entered our area, we failed to convince them to turn around (no surprise there) so we ventured out to Ptolemae, and the Pkunk continued their course into the heart of Yehat space. Our Science Officer monitored their activities very closely for days as they edged nearer and nearer to Gamma Serpentis, until early this morning, when they were all unfortunately absorbed by the brute strength of the Yehat’s fleet. Poor Pkunk. The one positive we can take from this learning experience is we now know exactly how long we can delay the Pkunk’s demise, but that means we will have to let the Pkunk fly almost all of the way into Serpentis before turning them one-eighty. Therefore, utilizing the time portal on June 16th makes the most sense; that way we can make the most of our time (about a year and three months) to come up with either some other plan to turn the Pkunk around or use option B... whatever that may be. Once back in the June 57’ timeline, I’m going to have us head back to Starbase so we can see if there are any interesting new developments concerning the Zoq-Fot-Pik before they get attacked, so hopefully we can be on the forefront of knowing any trouble going on at their homeworld, and with any luck we’ll have sufficient time to make it up there and save them! We will set course for Starbase. Captain out. Yeah. Go ahead and try. Even your fast starship will be taxed doing a mission all around the map and be back in time to catch the Pkunk going back. Think you can find a solution for that, especially with your track record of visiting every planet, moon, and solar system? I'm looking forward to see how you solve this conundrum. And no, I won't spoiler you by telling you whether it is possible or not. But do pack an suffient amount of fuel cells!